Alfred Publishing is proud to release Doctor Dolittle. This book features songs from the classic musical Doctor Dolittle. 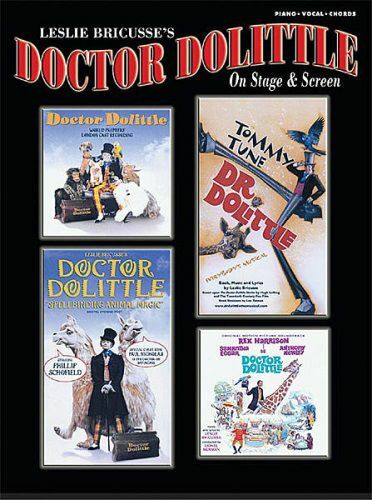 Doctor Dolittle is based on the Doctor Dolittle children's novels written by Hugh Lofting, about an eccentric veterinarian who can communicate with animals. Titles are: My Friend, the Doctor * The Vegetarian * Talk to the Animals * Doctor Dolittle * You're Impossible! * I've Never Seen Anything Like It * Beautiful Things * When I Look in Your Eyes * Like Animals * After Today * Fabulous Places * Where Are the Words? * I Think I Like You * Save the Animals * Something in Your Smile * The Voice of Protest * Puttle by-on-the Marsh * At the Cross Roads.